Sooty mangabeys, a monkey species found in West Africa, can be infected with SIV and yet avoid developing AIDS-like disease. To learn how they achieve this feat, a Yerkes-led team has sequenced the sooty mangabey genome. Peaceful co-existence, rather than war: that's how sooty mangabeys, a monkey species found in West Africa, handle infection by SIV, a relative of HIV, and avoid developing AIDS-like disease. To learn how sooty mangabeys achieve this important health feat, a Yerkes National Primate Research Center-led team of scientists has sequenced the sooty mangabey genome. By comparing it with the genome of humans and other nonhuman primates, the team has found clues that may help people infected with HIV. Studying how SIV and its natural hosts co-exist without AIDS could translate to improve long-term care of individuals infected with HIV, reduce mother-to-infant transmission as well as guide the development of a vaccine against HIV. The results were published online by Nature on January 3. Led by Guido Silvestri, MD, chief of Microbiology and Immunology at the Yerkes Research Center at Emory University, the scientists say this is the first example of inter-species genome analysis for identifying and validating genes that may regulate an important disease process. "We are taking advantage of an evolutionary experiment that took place over many thousands of years, revealing how it is possible to be infected with SIV and not progress to AIDS," says Silvestri, who is also professor of Pathology and Laboratory Medicine at Emory University School of Medicine and Emory Vaccine Center, and a Georgia Research Alliance Eminent Scholar. Co-first authors are David Palesch, PhD, a Yerkes postdoctoral fellow, and Steve Bosinger, PhD, assistant professor of Pathology and Laboratory Medicine and director of Yerkes' Genomics Core. Jeffrey Rogers, PhD, and his team of geneticists at the Baylor College of Medicine Human Genome Sequencing Center performed the genome sequencing and assembly. Dr. Rogers is a member of the Yerkes National Scientific Advisory Board. Additional contributors include Greg Tharp (Yerkes), Robert Norgren (University of Nebraska), Beatrice Hahn (University of Pennsylvania), Daniel Sauter and Frank Kirchhoff (Ulm University). "This project is a wonderful example of the scientific advances possible when we combine whole genome sequence analysis with expert understanding of the causes of disease, in this case the immune response to SIV infection," says Rogers. "By integrating genomics expertise from the Baylor College of Medicine with the long-term experience of the Yerkes/Emory team regarding sooty mangabeys, we have generated truly exciting and important results," he continues. Sooty mangabeys, along with other monkeys, such as drills and African green monkeys, are natural hosts for SIV. When infected by this virus, they maintain healthy levels of immune cells and do not progress to AIDS. 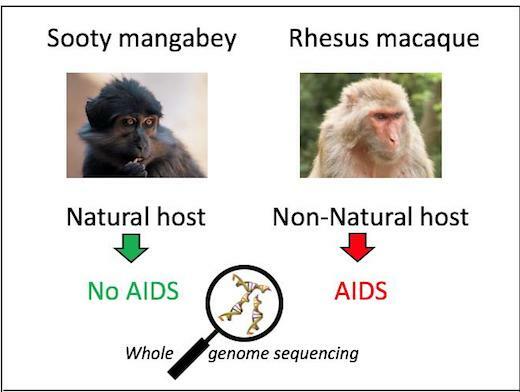 That protection contrasts with non-natural hosts, such as rhesus macaques, which do progress to AIDS-like disease, making them a model for understanding HIV infection of humans. Genetic analysis has shown HIV infection of humans arose through multiple cross-species transmissions of SIV from nonhuman primates, including chimpanzees and sooty mangabeys. "We found two big differences in proteins of the immune system in the sooty mangabey genome, which we hope will help us better understand why sooty mangabeys avoid AIDS despite SIV infection" says Palesch. One of the major differences is an adhesion molecule on immune cells. Called ICAM2, this molecule is not functional in sooty mangabeys. A deletion in the ICAM2 gene appears to be specific to sooty mangabeys and is not found in other SIV natural hosts or other primates, such as baboons and macaques. In addition, sooty mangabeys have an alteration of the TLR4 (toll-like receptor 4) protein, which impairs its function. TLR4 is part of innate immune sensing and triggers activation in response to components of bacterial membranes. "This finding is intriguing," Silvestri says, "because damage to intestinal barriers and bacterial release contributes to chronic immune activation, which is associated with AIDS progression in HIV-infected humans and SIV-infected non-natural hosts." In sooty mangabeys, a less active form of TLR4 may reduce immune activation in response to SIV infection. The TLR4 alteration was shared in the genomes of sooty mangabeys and other natural hosts, such as vervets, drills and colobus monkeys, but was absent in non-natural hosts, such as macaques, suggesting some evolutionary advantage. The scientists followed up to these findings to show how these differences affect immune cell behavior. A next step is to explore subtler genomic differences between sooty mangabeys and their relatives. In previous work Dr. Silvestri led, he and his research team compared the immune systems of sooty mangabeys and other natural hosts with HIV-infected humans, including viremic non-progressors, a unique group of patients that avoids HIV-related disease in similar fashion. The current study expands on that research by being the first to compare whole genome sequencing and identify pathways that may confer resistance to AIDS. With the success of this approach, the Yerkes team is planning future sequencing projects that look at additional natural host species. The Yerkes team also plans deeper studies on the genes it identified. "Future studies in which ICAM2 and TLR4 are manipulated in vivo during SIV infection are necessary to reveal whether and to what extent these two genes directly impact the non-pathogenic nature of SIV infection in this host species," the authors write. "It's a really exciting time in AIDS research," says Bosinger. "With the Berlin patient, who is the only person to have been cured of AIDS, we've seen HIV cure is possible. Sooty mangabeys and other natural hosts have for years served scientists as a roadmap to AIDS therapies, but we've only been able to look at small pieces of the map at a time. Now, by examining the entire genome of these species, our team believes we can accelerate discoveries that make a difference in the fight against HIV and AIDS." The research was supported by the National Institute of Allergy and Infectious Diseases (R37AI66998), the National Human Genome Research Institute (U54HG006484) and the NIH Director's Office of Research Infrastructure Programs (P51OD011132, primate centers, R24OD010445).